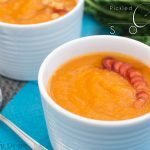 Inspired by one of the greatest chef's I know, Pickled Carrot Soup with Bacon challenges the balance between tartness, sweetness, and saltiness. Instructions for stove-top and Instant Pot. …oh, you guys have already done that? Right, well I have chosen right now to be my “New Year”. I had some things going on that were preventing me from seeing what I wanted to accomplish this year. Even though they're the same things as the last few years – it's just the details that are a little different. As always, I'm hoping this year will be full of self-growth, learning, improved fitness, amazing experiences, connecting with great people, and as much belly-aching laughter and face-burning smiling as possible. I've decided to read more this year. I'm already getting through way more books than usual, but I will admit that some of these are audiobooks and I'm not sure if that counts as reading. I started off with “The Sisters Brothers” which, if my brother-in-law hadn't explained was his favorite book, I would not have picked up based on the synopsis – but I loved it. The writing style really captured me. I then listened to “The Art of Asking: How I Learned to Stop Worrying and Let People Help” by Amanda Palmer, recommended to me by my doctor. It's one that I think most people would benefit from. You may remember that Holley had read “The Life-Changing Magic of Tidying Up: The Japanese Art of Decluttering and Organizing” by Marie Kondo. I'm just about to finish it myself and am looking forward to minimizing the stuff that I've got everywhere. Already it has changed my relationship with most of my possessions. It's interesting, the psychology involved, and Kondo is an interesting person. I think that she helps lessen the power that our possessions have over us. And how much better does it feel when there's less clutter around you? There's so much more “space” to be creative and productive. I feel so much calmer when my environment is less cluttered. My mind seems to be less cluttered at the same time. So, I feel like the big tidy up is my next step. 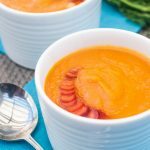 As for the Pickled Carrot Soup with Bacon, it may be too vinegary for some, but just add a little more syrup if that's the case. 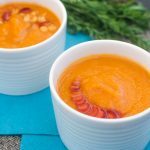 For those of us who are trying to save money, carrot soup is very affordable (and even more so later on when you can grow the carrots yourself!). What a great way to start off the year! 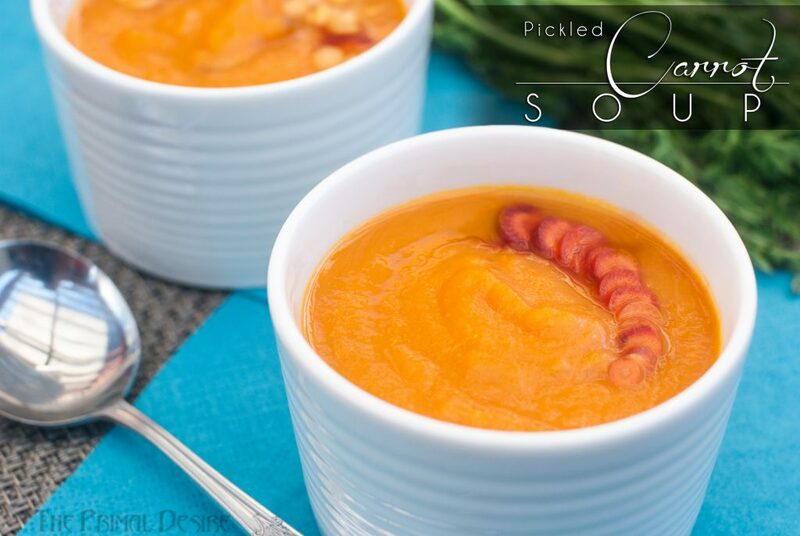 This soup is sour, sweet and salty. 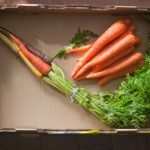 The little slices of pickled carrots on top give it an extra burst of flavor and some crunchy texture. 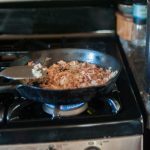 Cook onions and bacon together in frying pan until bacon is cooked but soft and onions are translucent. 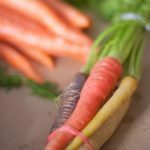 Slice 1 or 2 heirloom carrots (or the skinny end of a couple carrots) as thin as you are able. Put these into a small bowl or cup and add enough white vinegar to cover them. Let these pickle until the soup is finished. 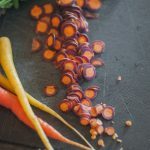 Chop remaining carrots into inch-long pieces. 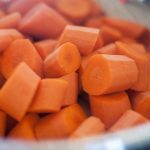 InstantPot: Put broth and chopped carrots into the pot, set to manual (high), and program for 4 minutes. 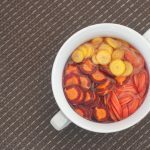 Stove-top: Chopped carrots and broth in a pot until carrots are soft. 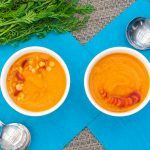 Once cooked, use an immersion blender to break down the carrots into a smooth soup. Stir in onions and bacon, add salt, apple cider vinegar, and maple syrup to taste. Serve topped with some of the picked carrots. Glad you got your new year going. And i agree with the clutter and the stuff. This year our goal is to buy less and experience more. Great plan Salma! Anything in particular planned? i like reading in general but this year, i have been busy with few other things. thank you for the reminder…you guys grow your own carrots? No, I don’t, I don’t think Holley does. My roommate might. Both of our parents do. How ’bout yourself?